LOUISIANA - Eh bien , jamais de ma vie ! 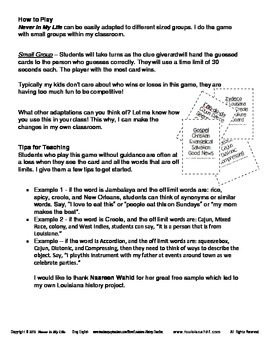 Never in My Life is a fun, fast-paced game in which students must try to describe words to their teammates without using the word, or words on the card (compare to Taboo/Off Limits). 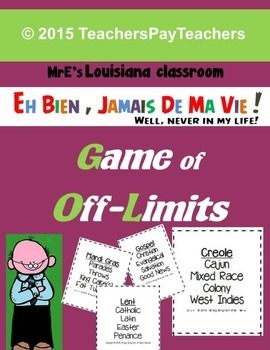 This game was developed because I wanted my students to work on their history skills. 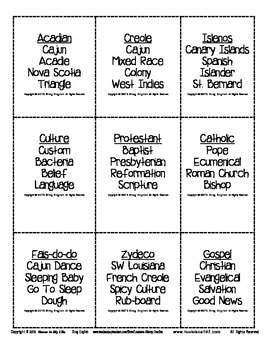 The game Taboo had words that were not appropriate for Louisiana, so I developed my own. 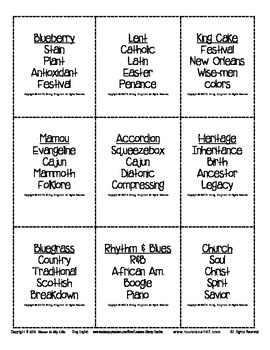 While playing Never in My Life students will be building Louisiana history and painting middle school history with words.